If you love your potato chips but worry about the ill effects of deep fried foods on your health, nowadays, there is a practical solution for you. And if this sounds like hot air, it’s probably because it is! Indeed, instead of cooking your chips in a deep fryer, you could cook them in what is called an air fryer which requires little or no oil by making use of rapid hot air circulation. An air fryer unit usually has one or more internal heating elements, a detachable cooking basket that holds the food while it's air fried, a removable pan that contains the cooking basket and collects drippings, and appropriate mechanisms to set the cooking temperature as well as the timer. Both the basket and the pan can easily be separated from the main body and washed in a dishwasher or cleaned by hand. Note that though these air fryers do not require oil, for perfect results it is recommended to sprinkle a tiny bit of oil (no more that a spoonful) on the foods to be fried. A typical air fryer is shown in the picture. Air fryers can be used not just for making chips, but because of the various temperature settings and programmable cooking times they allow, one could also grill, roast, and even bake. Because only very little amounts of oil should be used, you could experiment with various gourmet oils (such as olive oil, walnut oil, peanut oil, etc.) that would be too expensive to use for deep frying, resulting in chips with varied flavors. Because they require very little or no oil, air fryers generate much less cooking odor than traditional deep fryers. Air fryers are safer to use than regular deep fryers since there is no boiling oil, and they are usually equipped with cool-to-the-touch handles that allow handling without any danger of burning the fingers. They are very easy to clean as the removable parts (the pan and the basket) can be easily washed in the dishwasher. This article will compare the four most popular air fryers bought by Amazon customers. 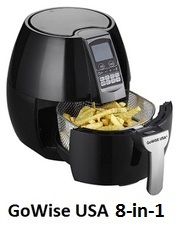 They are Philips HD9220, Philips HD9230, GoWISE USA 8-in-1 and Avalon Bay AirFryer100. These four air fryers were the top sellers in their category at the time this article was written and have received excellent reviews from Amazon customers (an average of at least 4 star rating out of 5 stars for each of them!). You will find below a point by point comparison of the selected air fryers. Selected Air Fryers on Amazon. The following table compares the four selected air fryers. Please read the explanations to the table notes for a better understanding of the features that come with each. Philips HD9220 comes in two versions: BLACK (HD9220/26) and WHITE (HD9220/56). Philips HD9230 comes in two versions: BLACK (HD9230/26) and WHITE (HD9230/56). GoWISE USA 8-in-1 comes in BLACK (GW22611) and WHITE (GW22612). Note that Release 2.0 of GoWise USA 8-in-1 is also offered in RED (when you click the Amazon product link for GoWISE USA in the Amazon section below, the Release 2.0 fryers will be offered as well). Except for how the control screen looks, Release 2.0 GoWISE USA 8-in-1 has the same features as the original version. Avalon Bay AB-Airfryer100 comes in three versions: BLACK (AB-Airfryer100B), WHITE (AB-Airfryer100W) and RED (AB-Airfryer100R). The different color versions of these air fryers have the same features. All four air fryers are equipped with a removable pan that contains a non-stick basket where the food is cooked (see Figure 2 above). The basket itself is easily detachable from the pan by pressing a button on the pan. The detachable basket makes it easy to transfer food from the fryer to a serving dish. Though capacity should be expressed in quarts, Philips official specifications for the capacity of these air fryers have used the pound form (1.8 lb for each model). Considering that the Philips air fryers basket dimensions are about (7"x7"x3"), we can estimate that their capacity is about 2.5 quarts. Philips HD9220: Uses a dial to set the temperature from 180°F to 390°F. Philips HD9230: Uses digital controls with an electronic screen to set the temperature from 180°F to 390°F. GoWISE USA 8-in-1: Uses digital controls with an electronic screen to set the temperature from 176°F to 392°F. Avalon Bay AB-Airfryer100: Uses a dial to set the temperature from 176°F to 392°F. Philips HD9220: Uses a dial to set the timer for up to 30 minutes. Philips HD9230: Uses digital controls with an electronic screen to set the timer for up to 60 minutes. GoWISE USA 8-in-1: Uses digital controls with an electronic screen to set the timer for up to 30 minutes. Avalon Bay AB-Airfryer100: Uses a dial to set the timer for up to 30 minutes. Note that only Philips HD9230 timer can be set for up to 60 minutes. All four air fryers shut off when cooking time on the timer is complete. 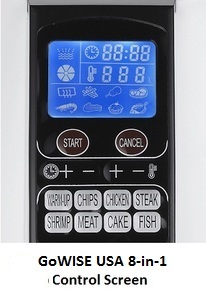 GoWISE USA 8-in-1 is equipped with 8 buttons specially programmed for Warm-Up, Chips, Chicken, Steak, Meat, Shrimp, Cake, & Fish. Only Philips air fryers have optional accessories. They are the Philips grill pan, baking dish and the double-layer rack that maximizes cooking surface. Note that the double-layer-rack is included with Philips HD9230 air fryer. Please refer to the Amazon section below for these optional accessories. Philips Air Fryers (both models): Black and White. GoWISE USA 8-in-1: Black and White. ​Note: Release 2.0 of GoWISE USA 8-in-1 is also offered in Red (when you click the Amazon product link for GoWISE USA in the Amazon section below, the Release 2.0 fryers will be offered as well). Except for how the control screen looks, Release 2.0 GoWISE GW2262 has the same features as the original version. Avalon Bay: Black, Red, Stainless Steel and White. For all four air fryers considered here, only the removable pan and detachable basket are dishwasher washable. The body of the unit contains the heating element and should not be brought into contact with water! The Amazon prices shown in the table were in effect at the time this article was written and may have changed. For exact prices, please refer to the Amazon products section below. Note that the Amazon price often includes a generous discount to the list price. If a discount exists, both the Amazon price and the list price will be displayed when you click the Amazon product link images below. So which air fryer is best to buy? Only the Philips air fryers come with optional accessories such as a grill pan, a baking pan or a double layer rack. So, if you want to have more flexibility when cooking various types of foods, you may want to consider one of the two Philips air fryers. Note that the double layer rack is included when you purchase the Philips HD9230. Only GoWISE USA 8-in-1 and Philips HD9230 have digital controls with LCD screens for setting the timer and the cooking temperature. So, if you prefer electronic controls over dials, then you should consider either the GoWISE USA 8-in-1 or the Philips HD9230. Only Philips HD9230 has a 60-minute timer (the other three air fryers have all 30 minute timers). So, if you are planning to use your air fryer to prepare recipes that require more than 60 minutes of cooking, you should consider the Philips HD9230. Finally, Avalon Bay is the only one that is equipped with an additional top carry handle. You will find below all four air fryers compared above. Please click the air fryer of your choice for price information or to purchase. Note that when you click the Amazon product link images below, you will be offered additional colors to choose from, whenever available. 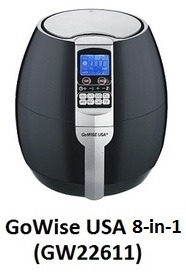 Note: When you click GoWISE USA 8-in-1 air fryer below, you will also be offered the Release 2.0 GoWISE GW2262 USA 8-in-1 air fryers. Note that except for how the control screen is designed, Release 2.0 GoWISE USA 8-in-1 fryer has the same features as the original version. Note that the double layer rack shown below is included when Philips HD9230 is purchased.